Save up to 75% on your weight loss prescription medications! These weight loss prescription discount coupons are pre-activated and can be used immediately to save up to 75% on your prescription diet pills. You ("you" or the "User") have a nonexclusive, nontransferable, limited and revocable right to use the Web site solely for your personal educational and informational use, subject to the terms and restrictions herein contained. User will not use the Web Site for any other purpose, including any commercial purpose, without the Company's express prior written consent. User agrees to cooperate with weightlossrxcard.com in causing any unauthorized use to immediately cease. All rights, titles and interests in and to this Web site are owned by weightlossrxcard.com. All trademarks, service marks and trade names are also proprietary to weightlossrxcard.com. None of the items mentioned herein may be used without the express written consent of weightlossrxcard.com. All rights are reserved by weightlossrxcard.com. The web site and all elements thereof are provided on an "as is" basis without warranty of any kind, express or implied. weightlossrxcard.com makes no warranties or representations as to the accuracy of the content contained on the web site. weightlossrxcard.com does not warrant that the web site will operate or perform in a manner that is uninterrupted or error-free, or that the web site or host server will be maintained free of viruses or other harmful code. weightlossrxcard.com makes no warranties that the information presented on the web site is current, up-to-date or accurate. some states and jurisdictions do not allow limitations on implied warranties, so the above limitation may not apply to you. The foregoing shall be enforceable to the maximum extent permitted by applicable law. Under no circumstances and regardless of legal theory, whether in tort, contract or otherwise, will weightlossrxcard.com or any of its related or affiliated companies be liable to you or any other party for any direct, indirect, special, incidental, reliance, punitive or consequential damages, however caused, and regardless of character, including, without limitation, any damages relating to lost data, computer failure or malfunctioning, or otherwise. You specifically acknowledge and agree that weightlossrxcard.com is not liable for any defamatory, offensive or illegal conduct of user. The foregoing shall be enforceable to the maximum extent permitted by applicable law. You agree to this allocation of risk in relation to your use of the web site. If you disagree with any of the terms and conditions of this web site usage agreement, your sole and exclusive remedy is to discontinue using this site. weightlossrxcard.com may have provided links and pointers to Internet sites maintained by third parties ("third party sites") and may from time to time provide third party materials on this site. These sites are independently owned and operated by third parties, who have their own privacy practices. The third party materials in this site and the third party sites are provided "as is" and without warranties of any kind either express or implied. To the fullest extent permissible pursuant to applicable law, weightlossrxcard.com disclaims all warranties, express or implied, including, but not limited to, implied warranties of merchantability and fitness. weightlossrxcard.com does not warrant or make any representations regarding the use or the results of the use of the third party materials in the third party sites in terms of their correctness, accuracy, timeliness, reliability or otherwise. Although parents are free to use this Web site on behalf of their children, weightlossrxcard.com does not direct this site to children or knowingly collect personal information from children. We are sincerely committed to protecting your personal privacy. While information is the cornerstone of our ability to provide superior service, our most important asset is our members' trust. Keeping member information secure is a top priority for weightlossrxcard.com. This Usage Agreement is effective July 15, 2014. weightlossrxcard.com may change this Usage Agreement at any time without notice. If weightlossrxcard.com makes revisions or changes to the Agreement, the changes will be contained in the Usage Agreement and the effective date will be noted, so please check this Agreement periodically. Except as described otherwise, all materials in the weightlossrxcard.com site are made available only to provide information about weightlossrxcard.com. 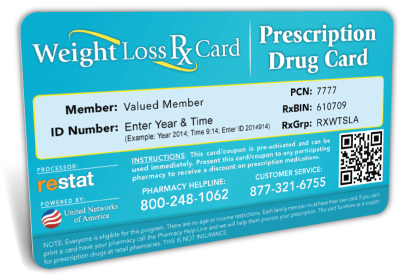 weightlossrxcard.com operates this site from its headquarters in the United States of America and makes no representation that these materials are appropriate or available for use in other locations. If you use this site from other locations, you are responsible for compliance with applicable local laws. weightlossrxcard.com's performance of this Agreement is subject to existing laws and legal process and nothing contained in this Agreement is in derogation of weightlossrxcard.com's right to comply with law enforcement requests or requirements relating to the User's use of this Website or information provided to or gathered by weightlossrxcard.com with respect to such use. This Agreement constitutes the entire agreement between the User and weightlossrxcard.com with respect to this Web site and it supersedes all prior or contemporaneous communications and proposals, whether electronic, oral or written, between the User and weightlossrxcard.com with respect to this Website. A printed version of this Agreement and of any notice given in electronic form will be admissible in judicial or administrative proceedings based upon or relating to this Agreement to the same extent and subject to the same conditions as other business documents and records originally generated and maintained in printed form. As a condition of use of this Website, the User agrees to indemnify weightlossrxcard.com, its affiliates, and the directors and employees of any of them against and from and against any and all claims, demands, judgments, costs, liabilities, expenses (including attorneys' fees) and damages arising out of legal claims resulting from User's use of this Website, including, without limitation, any claims alleging facts that if true would constitute a breach by User of these terms and conditions. While weightlossrxcard.com believes that most providers, members, groups, and brokers are honest, there are a small number of people who try to take advantage of weightlossrxcard.com and our members by engaging in health care fraud and abuse. There are numerous unofficial drug card programs and websites. weightlossrxcard.com is a legitimate administrator for drug cards and value added benefit programs and reports any imposters.